Good morning all! The end of another week, phew! But I tell you what, I’m so not looking forward to next week – blergh. Too many appointments and general craziness. As long as I have time to rock an awesome mani though, I’ll be all good. 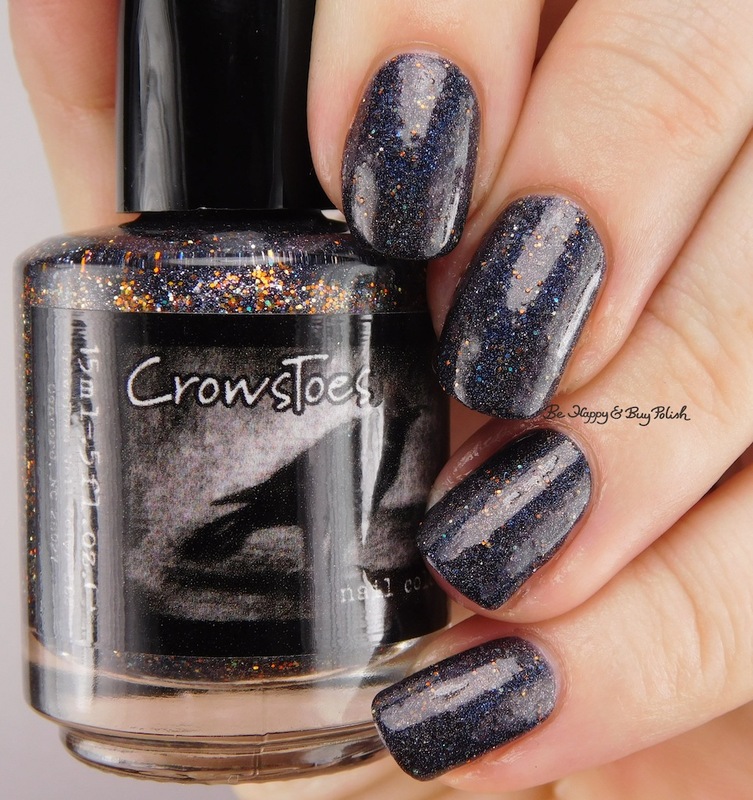 😀 Speaking of awesome manis, how about three awesome nail polishes from CrowsToes Nail Color for Hella Holo Customs month of September? Read through to the end for details on how to purchase! It has this really pretty golden shimmer that was hard to capture on camera. It honestly reminds me a bit of blue satin that’s placed in coffins. Eeep! Formula was a bit thicker than I personally prefer, and I did experience dragging between coats. This is 3 thin coats plus top coat. Formula was perfect! I did thin first coat followed by a thicker second coat. This is 2 coats plus top coat. This is fall in a bottle to me. Seriously, I’d slather myself in this polish if I could. I will probably end up buying myself a second bottle, tbh. The teal glitters that I swear also look purple at certain shifts – the deep orange to red base that is a fall leaf turning colors with the golden orange shimmer. Oomph!! Formula was thicker than I’d like, and I ended up having polish ball up on the neck while I was applying this (because this was my full mani for almost a week, y’all!). I did mention this to Lauri, the maker, who said it’s the likely the larger size glitter that’s doing that; she also let me know she’d add a bit of thinner to this and Your Last Breath. This is 3 coats plus matte top coat to smooth plus shiny top coat. Okay, now how to get your grubby little hands on these beauties? Read on! First, be a member of Hella Holo Customs group on Facebook. Sales are open now until September 30th at 11:59pm HST. These polishes are available for pre-order, which means they won’t start shipping until sales close. There are discount codes available as long as you are an HHC member, each of these polishes are $13.75 before discount. Once you are in the group, head to this permalink for details on how to purchase. So holler at me in the comments, which one is your absolute favorite? I love your swatches, they’re beautiful but also look true-to-life if you get me 🙂 I’ve been going back and forth on getting these, but seeing your swatches pushed me over to the “need to buy” side! These are some great colors. I think I have to agree with you, Beyond Your Fears is the prettiest (though I love these all!!!). Oranges with gold are always pretty, but that teal glitter makes it amazing.